A British woman has died fighting alongside an all-female Kurdish militant group in Syria. Anna Campbell, a qualified plumber from east Sussex, was 26. She is the first British woman to die fighting alongside Kurdish forces. Campbell persuaded her commanders to let her fight Turkish forces in Afrin, and even dyed her hair from blonde to black to look less conspicuously Western. A British woman who travelled to Syria to fight against ISIS alongside Kurdish forces has died. Anna Campbell, 26, spent months opposing ISIS in the besieged city of Deir Ezzor; but ultimately died in action against Turkish forces, who have been attacking Kurdish fighters inside Syria. The native of Lewes, east Sussex, volunteered for the US-backed Kurdish Women’s Protection Units (YPJ), the all-female affiliate army of the Kurdish People’s Protection Units (YPG). The convoy she was travelling in near the city of Afrin was struck by a Turkish missile, The Guardian reported. 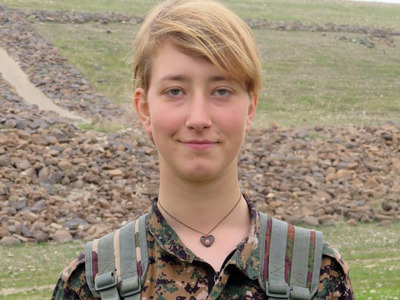 She is believed to be the first British woman to die fighting alongside Kurdish forces in Syria. Several men, including 24-year-old Jac Holmes, have died fighting for the Kurds over the past few years. Anna Campbell from East Sussex aged 26 was killed by artillery fire by Turkey on Saturday 17th March. She had been defending Afrin with the YPJ from invasion by Turkey and its jihadists. Campbell, who was a plumber in the UK, travelled to Syria in 2017, the BBC reported. While there she was given the nom-the-guerre Helîn Qerecox, The Guardian said. She originally went to fight ISIS in Deir Ezzor, but later persuaded her commanders to send her to Afrin to fight against Turkey – and dyed her blonde hair black to convince them. Turkish forces launched a ground and air offensive against Kurdish militants in Afrin, which is near the Turkish border, alongside the Free Syrian Army in January. Turkey considers the YPJ and YPG an extension of the Kurdistan Workers’ Party (PKK),whom they see as terrorists. The EU and US also consider the PKK a terrorist organisations. The YPG withdrew from Afrin on early Sunday morning after Turkish and Syrian rebel forces besieged the city. Some 150,000 civilians also fled over the weekend. “She was determined to live in a way that made a difference to the world. She was determined to act on that and do whatever it took. She was prepared to put her life on the line, actually. There aren’t many people who do that. “[Campbell’s] martyrdom is a great loss to us because with her international soul, her revolutionary spirit, which demonstrated the power of women, she expressed her will in all her actions. “On behalf of the Women’s Defence Units YPJ, we express our deepest condolences to [her] family and we promise to follow the path she took up.